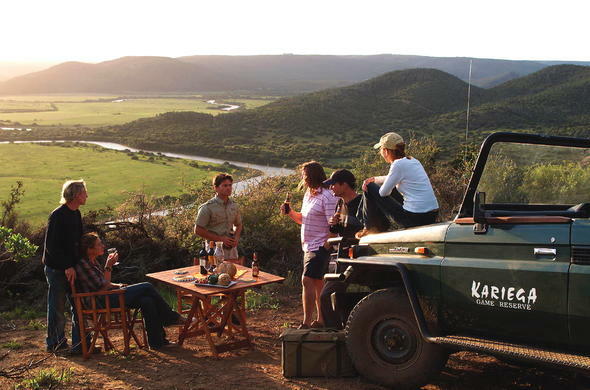 Kariega Game Reserve comprises of accommodation options in 5 different lodges. With lodges set in secluded locations and offering exciting safari activities, a stay in this Eastern Cape game reserve makes the ideal safari vacation in South Africa. Kariega Game Reserve is a sanctuary of abundant wildlife including the Big Five (Lion, Elephant, Buffalo, Cheetah, Rhino) as well as Hippo, Giraffe, Zebra, Hyena and a variety of Antelopes. Even a wide range of bird species such as Martial, Crowned Eagle and Fish Eagle can be found in the reserve. This is the ultimate surrounding for your unforgettable South African safari vacation. It is almost impossible to get closer to nature. The lodges are set high above the spectacular Kariega River Valley. This is a wondrous African wilderness in the heart of the 1820 Settler Country with a rich historical heritage. The golden beaches of Kenton-on-Sea are only a few minutes away from the reserve. Kariega accommodates guests in luxurious lodges and offers a variety of adventurous activities. Guests can go on exciting game drives or guided walks which are accompanied by one of the reserve Rangers. South Africa's famous Garden Route starts or ends only some kilometres east of Port Elizabeth and should be an option for every visitor of Kariega Game Reserve.